It seems like Gabby Williams has been a newborn forever, and she has. She still wears diapers and nurses every three hours. But the little Montana girl with the long hair is 6 years old. As each of her younger siblings were born and grew into toddlers and then developed into older children, she stayed the same. A normal 6-year-old would weigh an average of 46 pounds and be about four feet tall. Gabby is 10 pounds and only about 24 inches long. "She had all her medical tests when she was first born and they couldn't find anything," said Gabby's mother, Mary-Margret Williams, 37, who lives with her family in a suburb of Billings, Mont. Her condition -- so rare that there is no name for it -- will be showcased in "My 40-Year-Old Child," a one-hour TLC documentary that airs Sunday night at 9 p.m. The film follows Gabby and her family, as well as Nicky Freeman, a middle-aged Australian in the body of a 10-year-old, as they try to unravel the medical mystery. They are Benjamin Button children -- only about a half dozen of them in the world, who age only one year for every four in the life of a normal human being. And so far, doctors can find nothing wrong with them. Their chromosomes are normal, but they all have cognitive deficiencies. Gabby is blind and will never speak. "She cries when she is hurting and sometimes smiles," said Williams. "But there's not a whole lot of communication." "She is definitely very slow, but she knows when mama and grandma are holding her," she said. "She comforts to people around her. She knows her sisters, who have watched her quite a bit and listens to them play. We have a wild bunch around here." Williams and her husband, John, have three other children -- Sophia, 7; Anthony, 4; and Aleena, 3. And she is expecting another girl in March who, so far, has shown no abnormalities. "They watch me very carefully because of Gabrielle," said Williams. Doctors didn't think Gabby would live long after she was born in 2004. "We took her home and decided to love her as she is," said Williams. "Gabby is still with us today. She is tougher than most of us." Dr. Richard Walker of University of South Florida College of Medicine, who has been fascinated by the topic of aging since his undergraduate days, is comparing Gabby's genetic code to another a 19-year-old girl, Brooke Greenberg of Baltimore, who has the same condition. He wants to figure out not only what is wrong with these children, but learn if others in the family could pass on genes for this bizarre disorder. Brooke still had baby teeth at 16 and her bone age was estimated to be more like 10. 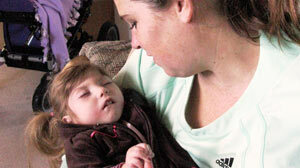 "There've been very minimal changes in Brooke's brain," Walker told ABCNews.com in an interview in 2009. "Various parts of her body, rather than all being at the same stage, seem to be disconnected." Walker also is studying Nicky Freeman. Like Gabby, he was born blind and was close to death for a few months. When he was 1 year old, Nicky said his first words: "Mommy," "Daddy" and "Teddy." But at 14 months old, he mysteriously stopped talking and hasn't spoken since. His mother, Kayleen Freeman, said one of her friends asked, "Does that mean if he is going to be in his 70s, he'll really be 280?" Freeman told filmmakers that she was convinced her son understands things, because he will pick up conversations and "burst into laughter." He loves music, "loud and fast," and talks with his body language. "He really loves having a massage," she said. "He comes over to me and shows exactly where he wants his back rubbed." Even though Nicky has not grown beyond the size of a grade-school student, he has a voracious appetite, eating twice what an adult eats, according to his mother. The same holds true for Gabby. "It doesn't matter what her nutrition is," said her mother. "She doesn't get bigger." The Williams family met the Freemans when they came to the United States to consult with Walker. "It was great," said Williams. "I think Nicky has a lot more abilities than Gabby. He walks and I don't know if she will get to that point. But talking with his mother, there was a connection for me." Raising a perpetual infant is tiring. There always are two infant seats in the car -- one of the latest baby and one for Gabby. Some people think Williams has twins. But, she said, "Like everything in life, you learn to do what you've got to do." On top of caring for Gabby, Williams has worked in a doctor's office continuously throughout the birth of all her children. Her employers have been flexible, allowing her to work most days from home. The hardest part is listening to Gabby cry and not knowing why. "That's hard for a mom," Williams said. "Not knowing how to fix it." But Gabby's ability to connect with people "without even saying a word" is gratifying, according to her mother. "It's always the most beautiful thing to see Gabby and how she touches strangers' lives," said Williams. "Whenever we are in public, they stop because of her hair -- how much she has. I tell them she's only 6 and we have a discussion. "I always say I have come to a peace with Gabriel," said her mother. "For a long time I was waking up in the night, thinking I would get up and she wouldn't be alive anymore. But we are Catholic and put our faith in God. Gabby is God's child and he will take care of her."